Space Matter is a weekly column that delves into space science and the mechanics of spaceflight. From the latest discoveries in the universe around us to the fits and starts of rocket test flights, you’ll find analysis, discussion, and an eternal optimism about space and launching ourselves into the cosmos. It’s hard to believe that our universe has a shape—after all, nothing exists outside the universe, and our brains can’t truly comprehend nothingness—but it does. And that shape can be one of two forms: curved or flat. Curved can come in two varieties: closed (a sphere) and open (a saddle). Flat is just, well, flat. A few years ago, scientists made the startling discovery (backed up by considerable evidence) that the universe is, actually, flat. How is that even possible? How can something that contains three-dimensional space be flat? To start with, remember that “flat” and “two dimensional” are not the same thing. Let’s first distinguish between two terms here: the universe and the observable universe. The universe is every single thing that has ever existed, in every dimension. The universe doesn’t care if we can’t observe or perceive much of it; it exists whether we can (or will ever have the capacity to) see it or not. The observable universe is what we can see, measure, and observe, in whatever capacity that might be. So, we should amend the statement above by saying the observable universe is flat. For the purpose of this piece, the universe consists of three dimensions. (For the sake of simplicity, let’s set aside time as a fourth dimension and string theory, which posits even more dimensions we can’t perceive). We can chart a coordinate in the universe using three points: x, y, and z. And indeed, those coordinates can point to a star, a planet, a bevy of three-dimensional objects that are located within a flat, three-dimensional container: bumps on a smooth road, if you will. It’s important to note again that spacetime is not included in this; the theory of relativity tells us that spacetime is curved because of space and matter. The curvature of spacetime is what creates gravity. But in this particular case, spacetime isn’t relevant in the universe we’re describing. Think about the basics you were taught in geometry class: parallel lines never meet. A rectangle has four corners of 90 degrees each, and is a closed figure. This is called Euclidean geometry, and the problem is that it only works if you’re considering a flat surface. If you draw a triangle on a flat surface, the sum of the inner angles is equal to 180 degrees. Draw the same triangle on a curved plane (think putting a piece of paper on a globe, and then trying to draw a triangle). If you want to be able to close the triangle, the sum of the three inner angles is going to be greater than 180 degrees—non-Euclidean geometry. Curved space distorts perceptions and what we see as straight lines. Now let’s scale this experiment to something a bit larger: space. Take three coordinates in the observable universe and draw a triangle between them. If the sum of the inner angles of the triangles are greater than 180 degrees, then space is curved. If not, space is flat. So how did scientists come to the conclusion that space is, in fact, flat? It has to do with baryon acoustic oscillations. After the Big Bang, the universe was incredibly hot and filled with white hydrogen plasma. Light couldn’t penetrate the plasma. But once the universe started to cool, the plasma started to dissipate, and photons (light particles that are both a particle and a wave) were able to travel. The photons that were released at this time are what make up today’s CMB, or cosmic microwave background radiation. Baryons are waves of particles and energy that were trapped along with the photons. When they were released, they began traveling at a constant speed, and continue to do so. Baryon acoustic oscillations are regular, measurable changes in the density of baryons that we can use as a galactic ruler to measure the universe. A slice of the BOSS map of the universe, covering 6 billion light years. The color indicates the distance from the Earth (yellow is close, purple is far). 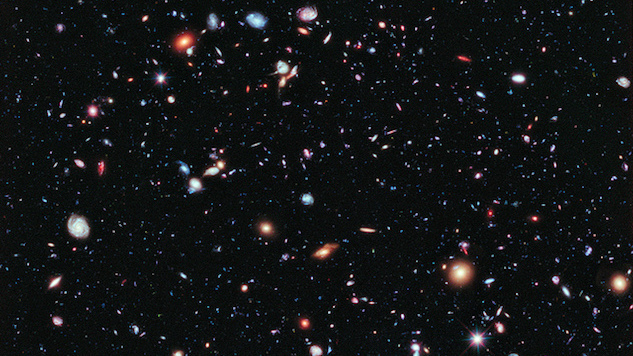 It contains 48,741 galaxies. Image: Daniel Eisenstein and the SDSS-III collaboration. Copyright. Findings from the WMAP spacecraft (Wilkinson Microwave Anisotropy Probe), which used fluctuations in CMB to calculate the geometry of the universe, support this conclusion with a 0.4% margin of error. WMAP’s universe measurements also tell us that the universe is infinite. Is it possible that it’s so large, then, that our perceptions are distorted? That the universe is actually curved, but much like an ant on the Earth, we just can’t tell because we’re so small? The universe is vast. And it’s expanding. (How can a thing be infinite and also expanding, you might ask? The universe has no actual boundary. It just is, forever. When we say the universe is expanding, we mean the stuff within it—galaxies are moving further apart from one another, and so on.) It’s conceivable that no matter what measurement we take, the universe is just so incomprehensibly giant that it will look flat to us. That’s the nature of the universe we live in.